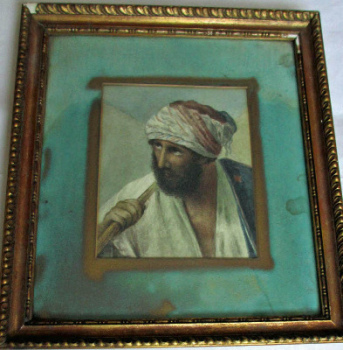 19th Century watercolour, gouache and oil paintings for sale @ Ranchi Art & Antiquarian Books. 19thC Persian School, social gathering, gouache on paper with Farsi script. Signed. Framed. c1820. A Bend in the River Wye, Bourne-End on Thames, watercolour and gouache, signed A.R. Williams, c1900. 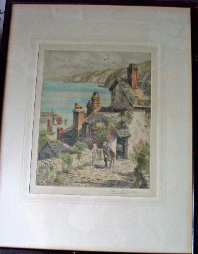 A COASTAL SCENE (CLOVELLY ROSE COTTAGE) COLOURED ETCHING BY HENRY G WALKER c1900. SOLD. A pair of 19th C Neapolitan School Views of Bay of Naples and Amalfi, gouache on paper, one signed A. Coppola. c1890. SOLD 19.09.2015. A pair of landscape pastoral scenes, watercolours on paper, signed monogram WSS, c1870. SOLD 08.02.2014. A pair of landscapes, unknown locations, gouache on paper, unsigned. c1900. A rainy street scene in Abbeville, watercolour on card, signed Hy Woods, c1890. 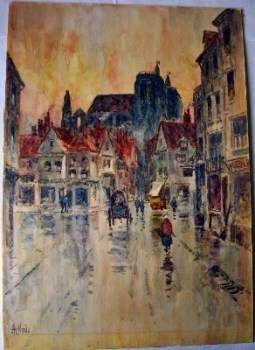 A Rainy Street Scene in Abbeville, watercolour, signed Hy Woods, c1890. SOLD 19.09.2014. 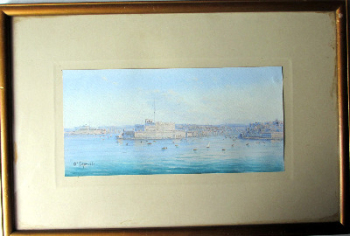 A triptych of Maltese Harbour Views, gouache on paper, signed D'Esposito. c1900. SOLD 10.06.2013. 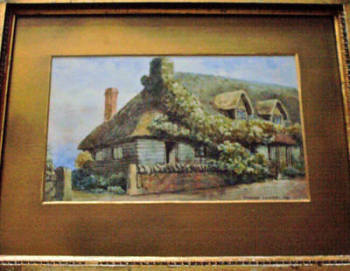 A Winter Sunset, oil on board, signed A. Allen, c1920. Glazed oak frame. SOLD 05.08.2014. A Woody Glen, North Wales, watercolour and gouache, signed A.R. Williams. c1900. SOLD 23.01.2018. 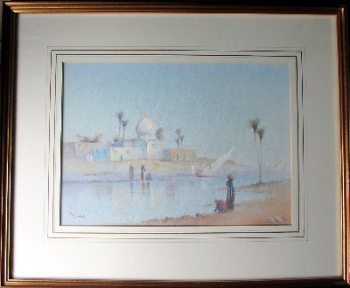 Along the Banks of the Nile, watercolour on paper, signed Augustus Osborne Lamplough, c1900. SOLD 01.02.2014. Amalfi Coastal View, watercolour and gouache, faintly signed H. Fusci. c 1900. SOLD 05.07.2014. Arabian portrait study, watercolour on card, unsigned. c1900. SOLD. 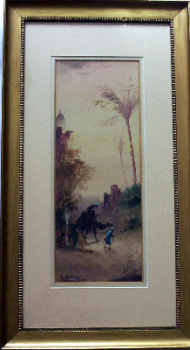 Arabian River Scene with Figures, signed R. Cooper, watercolour. c1900. SOLD 16.10.2014. Arabian Scene with Figures and Camel, watercolour on paper, signed E. Nevil, c1890. SOLD 07.10.2015. 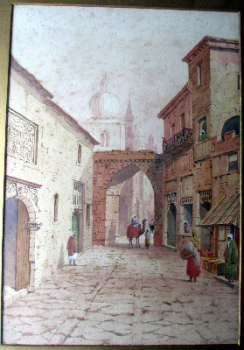 Arabian Street Scene with Figures and Camel, watercolour on paper, signed A. Lewis 1901. SOLD. Arabs in Conversation in a Ruined Temple, oil on wooden panel, signed W. Muller 43. 1843.